Here you can find a strain description about Double Fun (NoMercySupply) and also some user-based reviews and infos directly from the SeedFinder (if available). You can also find the offers and auctions here if Double Fun (NoMercySupply) cannabis seeds are on stock at MyCannapot right now. Citral was added in 1993 as a clone and as seed to the Library of the Positronics Fan Club. This happened with the original variety and cannot be compared with the Citral that appeared later in the market. At first the plant was very popular for indoor use until it was discovered how well suited it was for outdoor growing. An early flowering Dr. Weed Man was crossbred with a Citral female carefully selected from seeds. 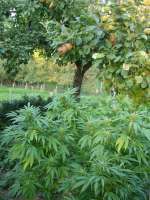 The resulting seeds were then bred to original Citral mother clones which eventually developed into a new species that was stable and fungi resistant. Double fun is a strong psychoactive product that always works and will never bore you! A highly stable variety, very well suitable for both indoor and outdoor growing. Looks: Fat buds with white hairs. Taste: Sweet, friendly and authentic. Buy Double Fun (NoMercySupply) now at MyCannapot!